Ready for my rundown of the Games? On the first day of the 2011 CrossFit Games, I woke up to a text from Joe Petrusky, checking to see if I wanted to carpool to the beach. 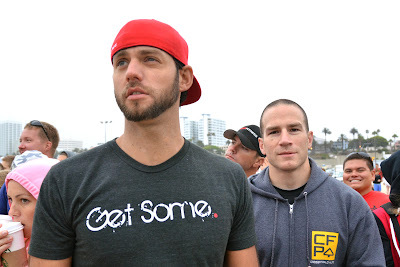 Joe, who owns and operates Philadelphia’s CrossFit Love, was staying at the same Japanese-run hotel; we figured this out when he replied to a tweet I’d sent the night before about the robot toilets in the bathrooms. 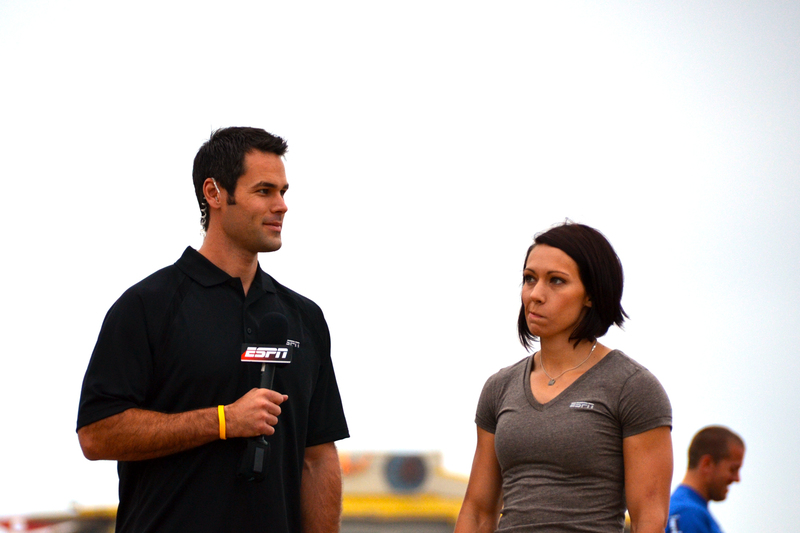 I was groggy -- less than five hours of sleep will do that to you -- but there was no way I was going to miss the opening event at Santa Monica Pier. With Joe as my navigator, we made it to the beach by 6:30 a.m., and with plenty of time to stake out a view of the action under the shadow of the Ferris wheel. 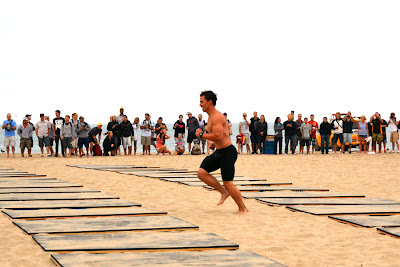 Overnight, Rogue Fitness had set up a pull-up rig in the sand, and a run course was marked off with orange cones. 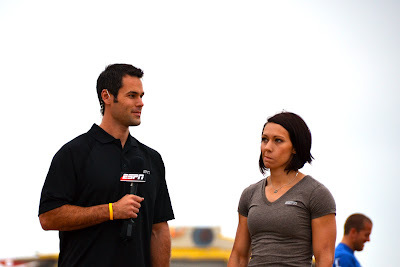 Rory McKernan and Miranda Oldroyd were milling around, waiting for their turn on camera. The set-up was impressive. 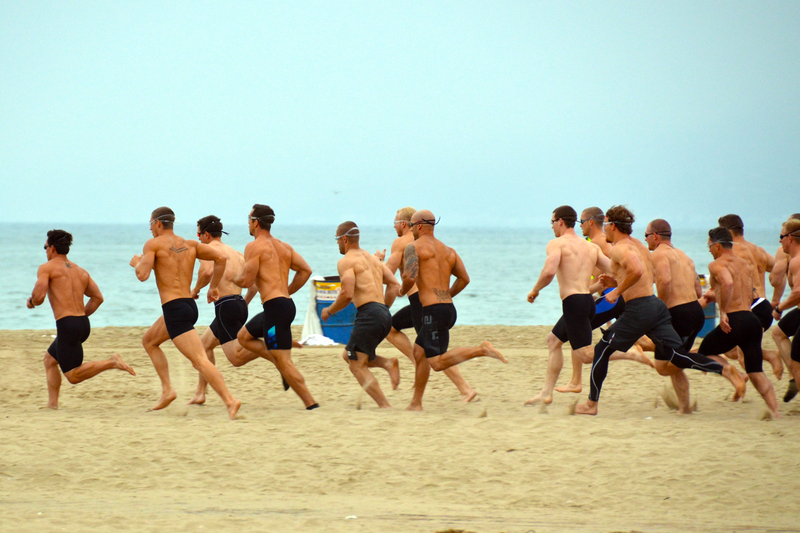 A little after 7 a.m., the men’s competition got underway with a sprint down the beach and into the surf. From where I was standing, I couldn’t make out much of the swim course, but soon after the guys hit the water, I could see a rescuer paddling to an athlete and helping him back to shore. 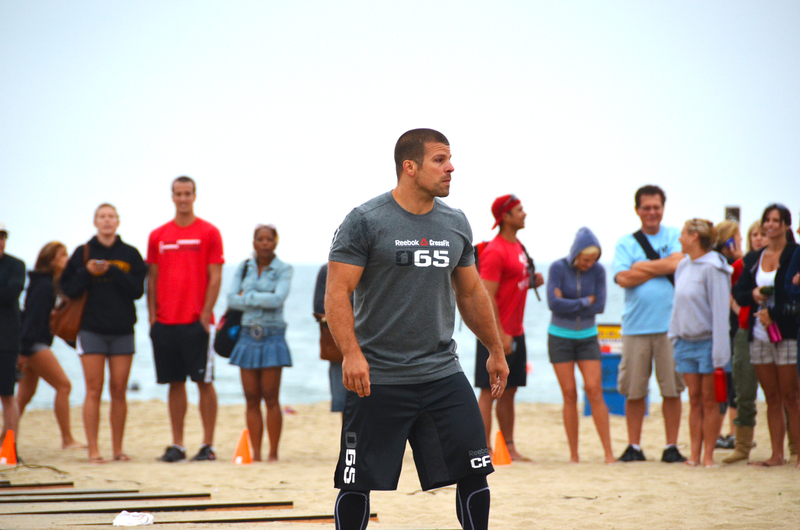 CrossFit Games veteran Rob Orlando, it seems, had grabbed the paddleboard to keep from sinking. And just like that, he was out of the competition. Chris Spealler wasn't far behind. This was awesome. Spealler and Bridges are two of the smaller male athletes competing as individuals in the Games, and are incredibly inspiring to me. 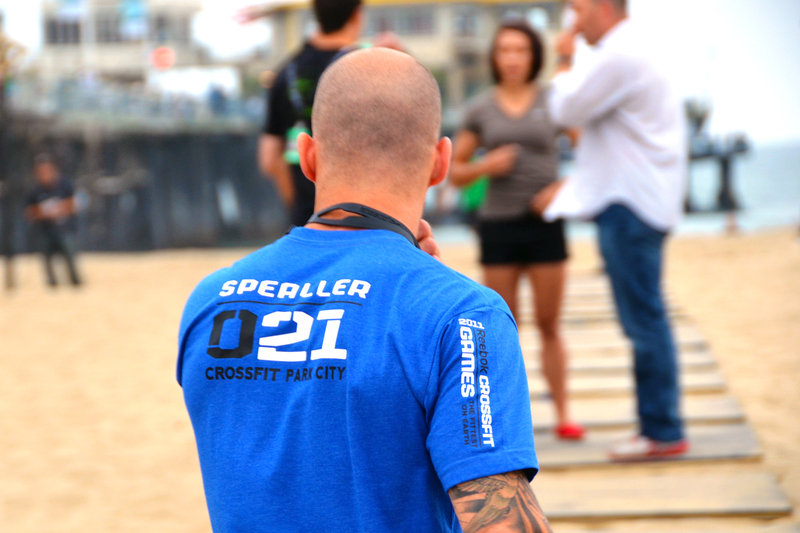 (In many ways, Spealler's performance in last year's Games kept me motivated throughout the first few months of my CrossFitting experiences.) It was amazing to see them in the one- and two-spots in the first event. By the time everyone started doing push-ups, Bridges and Spealler were already squatting like maniacs. 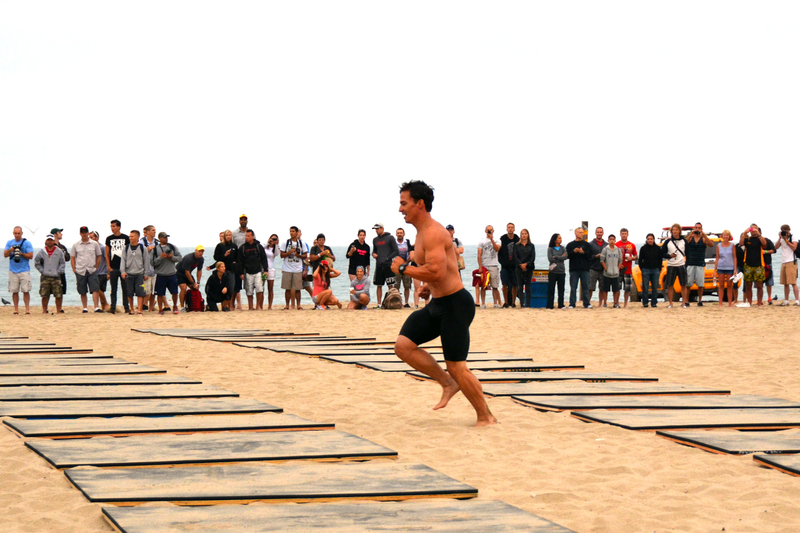 Bridges took off for his final 1,500-meter run before most of the other guys were done with their push-ups. He ended up finishing in just 33:21 -- almost twenty minutes ahead of Danie du Preez of South Africa, who continued gutting out the workout after everyone else had taken off for the run. 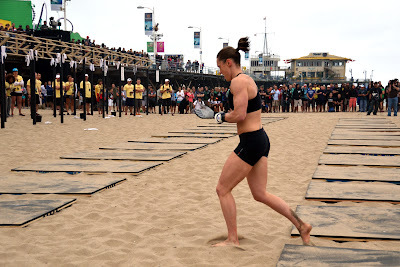 It was interesting to note that Danie, like many of the other competitors, used their hands to push off their knees at the bottom of their squats. 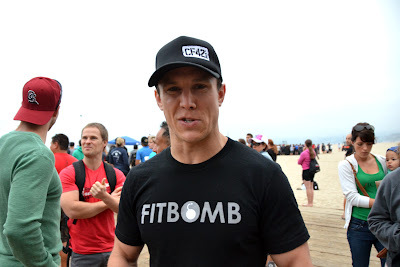 I'm sure they were all exhausted -- but I wonder how many CrossFitters are going to start adopting this approach the next time they do Murph or Cindy. 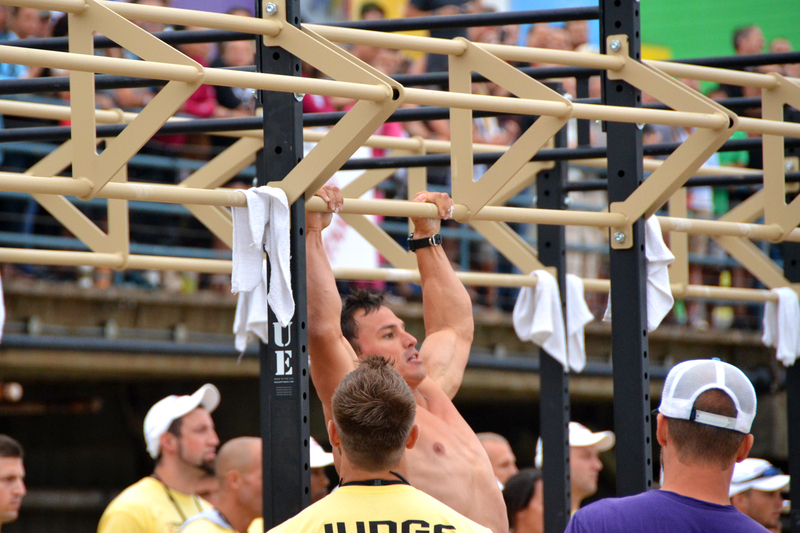 Danie was the last of the male athletes to cross the finish line, and Rob Orlando didn't finish the workout, but Event 1 claimed one more casualty: 2009 Games champion Mikko Salo. Mikko's eardrum ruptured during the swim, which killed his equilibrium. Somehow, he MANAGED TO FINISH THE ENTIRE WORKOUT in a state of extreme nausea and near-blindness before collapsing and puking. Though he was up and about after being treated by paramedics, it was clear that the former champ would not be able to compete in the rest of the Games. 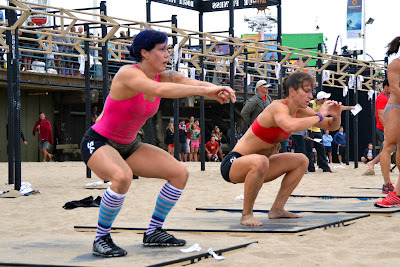 After the jump: The women's competition! To me, it looked like the women were more at ease than the men. 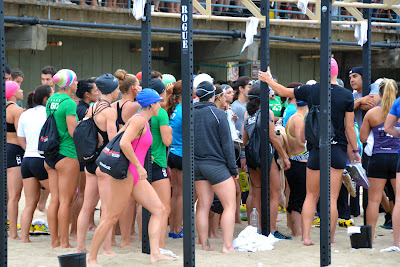 Many of them smiled and joked with each other; if you didn't know better, you wouldn't suspect that these women were competing for a quarter of a million dollars. Joe and I were joined by Tim as the women's event kicked off. 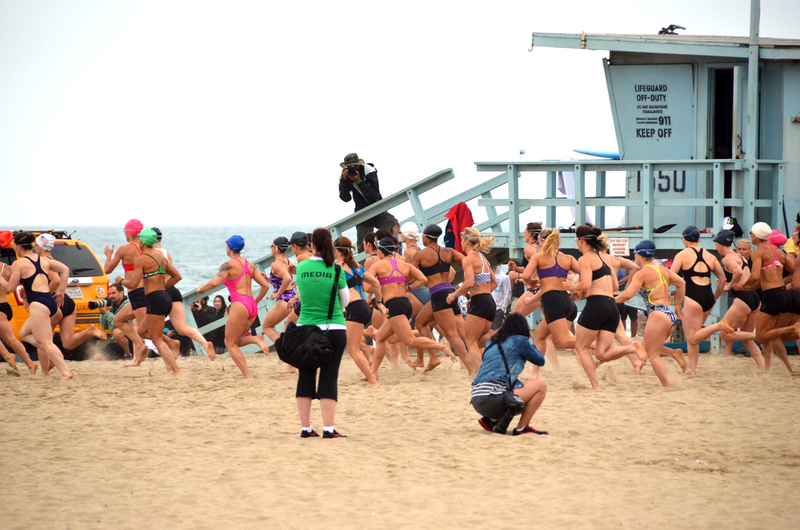 Pro triathlete Amanda Allen was the first to finish the swim and run. ...while others like original Nasty Girl Annie Sakamoto stayed close to their heels. 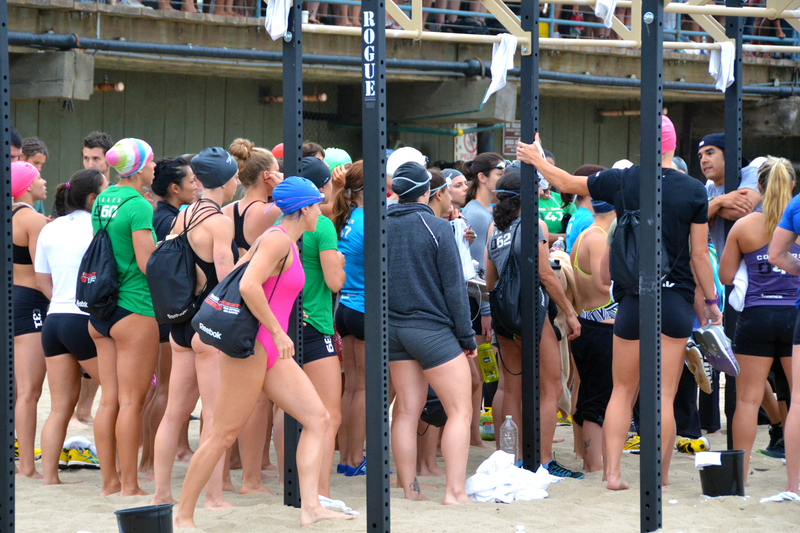 These strong, powerful women appeared to have no trouble ripping through the pull-ups. 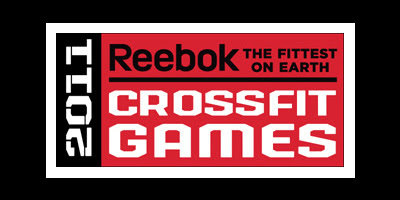 Annie Thorisdottir, who many picked to win the 2011 Games, didn't seem to break a sweat. But as the competitors moved onto the squats, the exhaustion started to show. 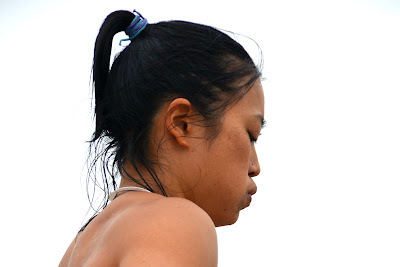 I was standing just a few feet from Elyse Umeda, and witnessed the whole gamut of emotions up close -- from frustration and pain to determination and guts. 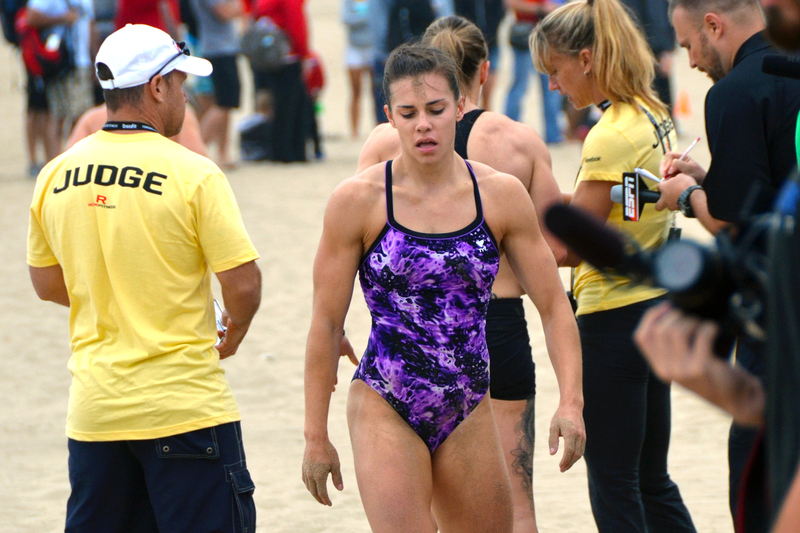 In the end, Julie Foucher and her purple swimsuit took the event, with an impressive time of 39:04. 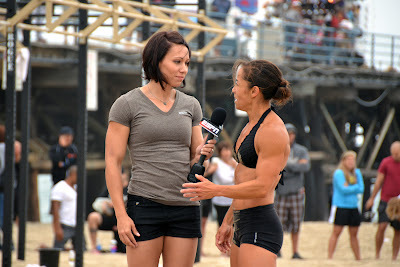 She had taken the lead during the chest-to-bar pull-ups, and maintained it for the rest of the event. 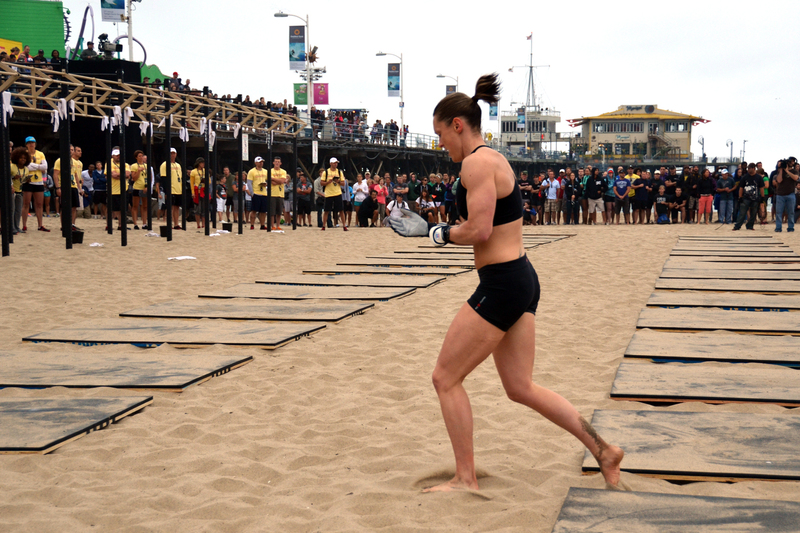 All in all, it was an incredible display of athleticism. 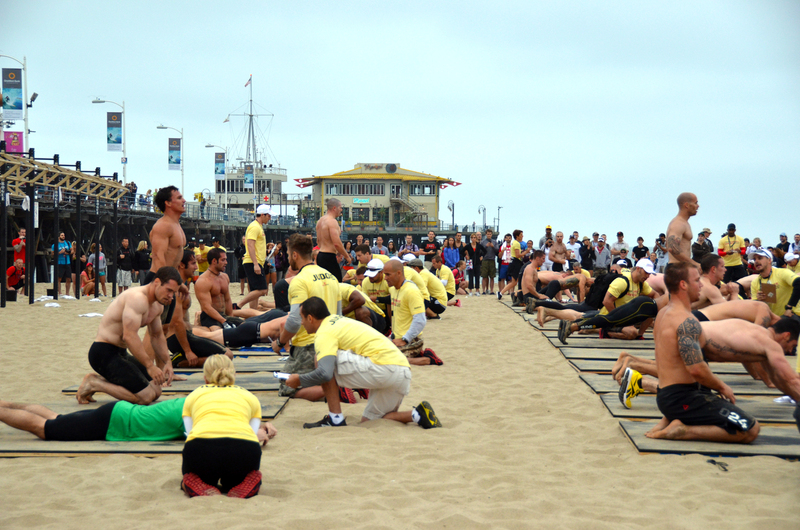 Event 1 perfectly showcased the sport of CrossFit, combining unexpected physical challenges (ocean swim! soft-sand run!) 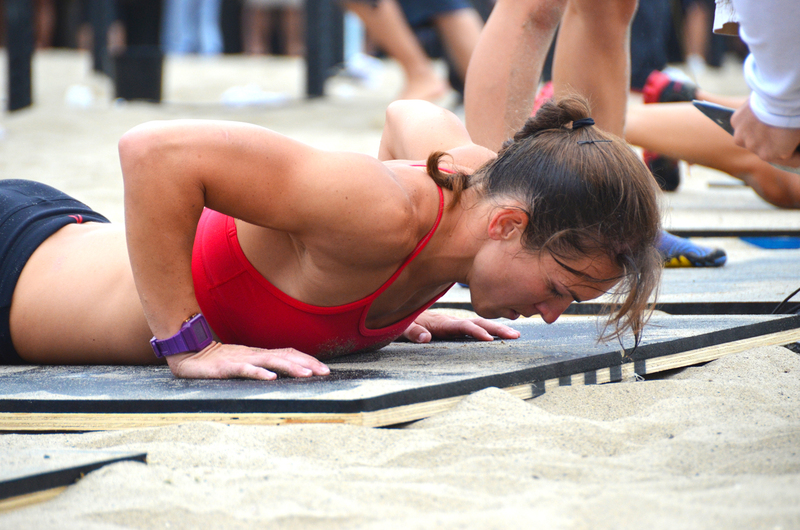 and core movements to create one hell of a challenge for the world's fittest men and women. Me? 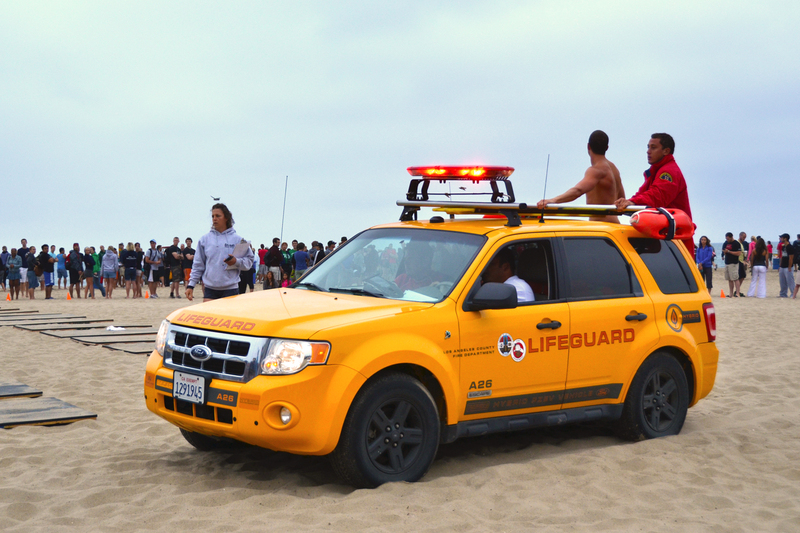 I was exhausted just watching 'em. The solution: Coffee. 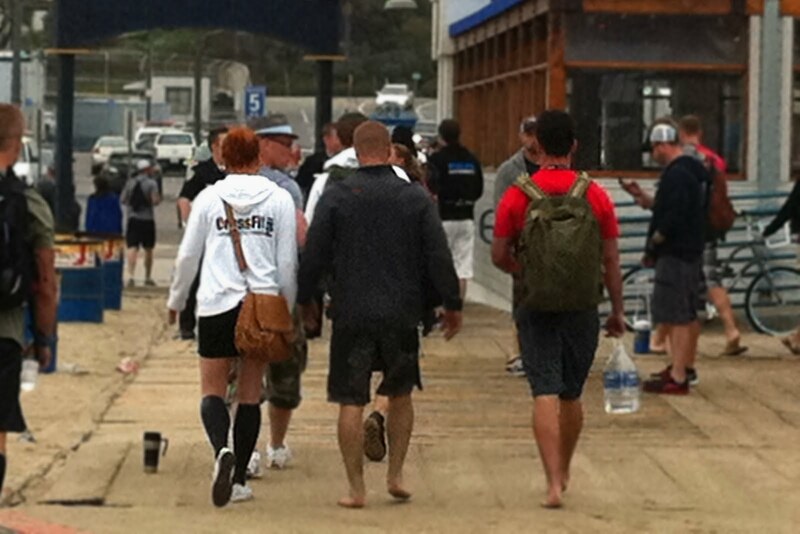 In case you don't recognize my fellow CoffeeWODers, let me introduce you to Eric Webb of Outside the Box, David DeLeon of RedBlack Gym, Tim Dymmel of CrossFit Palo Alto, and Joe Petrusky of CrossFit Love. Not pictured here: The Swedish girl who sat with us until I accidentally poured coffee on her.